Chameleon Universal Wet Room Shower Floor Seal - Stop Prevent Water Escaping! The Chameleon wet room seal is an ideal solution for situations in wet rooms or shower areas where the flow of water runs out of the floor area it is not intended to. It is a common problem with the ever growing popularity of walk-in shower areas coupled with power showers or high pressure shower systems. The water level rises, as the waste cannot cope with the flow required, and water escapes to the rest of the bathroom! 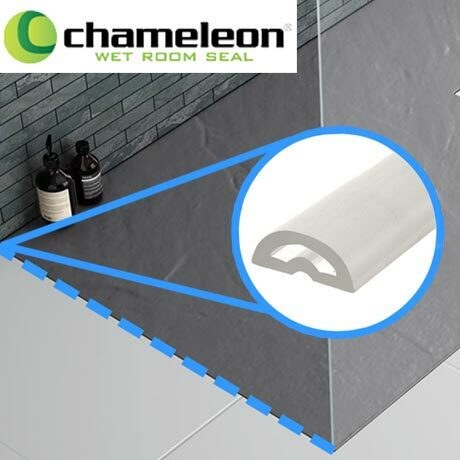 The Chameleon wet room seal is made from a soft translucent rubber that simply silicones to the required position on the floor area - tiled or vinyl. It offers an discreet barrier to stop the water escaping the shower area. The translucent colour helps the seal to blend in with its surroundings and the soft hollow design feels soft underfoot. All in all a fantastic solution to a common problem! Great idea this just what we needed saw other reviews which gave it top ratings so went for it glad we did. Perfect. Exactly what we needed to stop the whole floor getting wet. Had this problem since have having fabulous new bathroom fitted with wet room which we love but the spillage of water into the main bathroom was driving us crazy. Looked at all kinds of solutions and fell upon this one. Works a treat. Fabulous, no more spillage. Dedinately would recommend and a great price too.